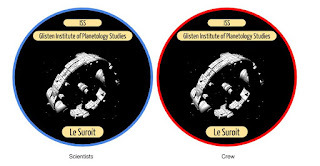 The Lab Ship, your standard 400 ton lab ship, is named Le Suroit. Part of the supplies in the ship include several lab coats and light cloth jackets. On the lab coats, the ship patch is on the left breast, on the jackets on the left shoulder. The patches are the same except for the border: crew jackets have a red outline and science has blue. Going through the staterooms, starting next to the bridge. 9 is Travis' room, as he is the pilot and expected to be available. 10 is currently empty; normally the navigator's room. 11 is Dr Duk-Lyle, taking the normal medic's stateroom, as well as being close to the bridge. 12 is Ferdinando's stateroom. On inspection, he has two duty coveralls with the appropriate patches, several sets of formal wear, a few sets of what he calls informal wear yet is expensive and hand tailored. Also hanging up is his Navy dress blues in a protective bag. 38 is Franklin's stateroom. His Naval uniform is hanging up as well, but not in a protective bag. He has a couple of the standard issue ship coveralls, work out clothes, well worn comfortable casual clothes. He also has cloth armor without the ship's insignia, and on closer inspection you can see that it is smart fabric as well, allowing for limited chameleon-like attributes. He also has a small locked arms case with small body pistol, and hanging on the wall is a rapier. A case of beer is also sitting in the bottom of his closet. 26 is Purity Truth's stateroom. Her room is extremely neat, with few personal items. Her clothing is functional and bland. 27 is Quentin's stateroom. He has various archeological studies scattered about, his clothing, while clean, is somewhat shabby and wrinkled. 29 is Tricia Odonnel's stateroom. She has the usual array of clothing, everything is neatly in it's place. On her desk is the safety manual for Le Suroit, looking well worn. 30 is currently empty, a standard stateroom with a bunk bed, small desk, and personal fresher. 31 has apparently been converted to a gym: a compact exercise machine takes up most of the space.